"The time for lies is over." The problem? Whose telling the truth and whose telling more lies? Thomas knows WICKED has lied to him before, when they sent him into the Maze and again when they dropped him into the Scorch. He knows they've used those closest to him as weapons of betrayal in attempts to collect data for their "cure" blueprint but now they say he and the other Gladers need to trust them one last time. This much anticipated final chapter in The Maze Runner trilogy is filled with action, and edge of your seat suspense that will leave you wondering who can really be trusted right up to the last page. Alliances will be formed, friendships will be put to the ultimate test and choices made that beg the questions, "Are the lives of a few worth losing to save countless more? and Do the ends always justify the means no matter what?" The Trials are finally over, the Gladers, having survived both the Maze and the Scorch are now at the WICKED complex and being given the option of having their memories fully restored, but Thomas and a few others aren't sure they want all of them back. For Thomas, regaining all of his memories means facing his past mistakes and the truth about what happened between he and Teresa. She pushes for him to get all his back, claiming they can work together to make things right again but he doesn't trust her especially since she still thinks, "WICKED is good." He resists even harder when Dr. Janson aka Rat Man, tries to convince him that he once believed a few lives were worth losing if it meant being able to save a lot more in the long run. Thomas is only more confused when Brenda and Jorge also appear to be working for WICKED instead of against it. What?! Don't they both have The Flare? If so, how can they be working for WICKED? (Maybe they really are past the "Gone" already) He begins to question if everyone has been lying to him? Janson tries a different approach, encouraging Thomas to think of all the good he'll be doing by having his memories back but Thomas still refuses. You see, he's already remembering things on his own, things that contradict what WICKED is working to accomplish. There's buzz about a Resistance and Thomas plots to escape the WICKED complex to find them along with Minho and Newt. When they turn back, deciding to take their friends with them they discover that Teresa and a group of others have already left - without them. If she believes "WICKED is good" why did she leave? Why didn't she take him with her? Once again, Teresa has betrayed him. As he sets out with Minho and Newt, he realizes fairly soon that even the Resistance aren't what they seem. Together, the friends will face challenges and trials more violent than anything they faced inside the maze. These will both strengthen their bond and stretch it to it's limit. Their past will catch up to them and it will be revealed that their futures are not all the same because one of them has the Flare. Knowing how the infected, or the "Cranks" meet a horrible end, one friend will ask another to do the unthinkable and the scenario plays out in a truly gut wrenching way, leaving the reader as heart broken as the character himself. In his search for answers, Thomas will be asked to endure a final test, one that could change the course of the human race. His decision to participate will give him the chance to make amends but it will cost him in ways he never imagined. He'll discover that sacrifice is not only about what you give up but how far your willing to go to save another's life. I know that Thomas is the main character throughout this series but my absolute favorite was Minho! His sarcastic, "take no klunk" attitude was just awesome. He's the shank you want on your side for sure. Yes, he's got an attitude, yes, he can be a slinthead at times but you know without a shadow of a doubt that he has your back, no.matter.what. I definitely want that shank on my side if I get caught in a dark alley, or a maze or a scorch. Where can I buy my TEAM MINHO shirt?! Strong male and female characters who stick up for each other and fight to do the right thing even if it means sacrificing their own lives. oh my goodness! i have finally finished reading the trilogy... i still have Kill Order and Fever Code to go. but i can finally say, i have finished the series. this has been a thrill ride even though i read some spoilers before i read them. and truthfully, it took out the genuine emotions i have in some situations. but i still stand in it being a good book. though this is the last book, i didn't find it as exciting as scorch trials. this was crazy good but this book has been more about finding out all the answers. so this has been more explanation than anything else. quite disappointed about meeting new characters in scorch trials that barely mean anything in death cure. i thought that part was such a good plot but it sucked that they barely matter. i can't remember if i said this before, but this book can be so realistic in terms of climate change and with the environment. and i think that the author gave a very real world to us in the far future. but the real reason for the existence of WICKED was just wow but at the same time, meh! but that's science for you. i'll stop talking now cause i know my opinion won't matter since the book has been long ago at the same time there probably thousands of reviews already. in general though. good book, great trilogy. not too excited to read the prequels, but they are definitely in my to-be-read list. Considering my dislike for both The Maze Runner and The Scorch Trials, I seriously considering abandoning this series. However, the first two books in the series did pique my curiosity enough that I decided to read The Death Cure in order to find out a) why these group of children were subjected to such horrors and b) how WICKED could possibly hope to create a cure out of their struggles. 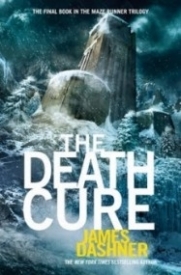 Unfortunately, The Death Cure continued to use Thomas’ lack of memories to keep the reader in the dark for most of the book, and then gave us the weakest explanation for a series’ sequence of events I have ever had the misfortune of reading in a dystopian. In my review of The Scorch Trials, I commented on how Dashner’s various plot twists seemed pointless, “like Dashner was just making things up as he went” giving the book “an almost careless and unplanned feel” and I hate to say it, but that feeling of meandering continues with The Death Cure. And then I finally realized what was happening to make me feel that way! Dashner has not written a layered tale. "Think back on those really satisfying endings. Those “AHA!” moments in a story when the final twist is revealed and the carefully laid–yet hidden!–clues are suddenly so obvious. All those connections you had missed were right before your nose the whole time!" So after hundreds of pages where it felt like we were merely spinning in circles, as nothing was connecting and nothing was being done to actually defeat WICKED, you could say that I was ready to completely throw in the towel when Thomas started considering helping WICKED with their next round of trials. "For some reason, Thomas couldn’t get Janson out of his head. Could going back really be a way to save [name removed]? Every part of him rebelled against the idea of returning to WICKED, but if he did go back, and was able to complete the testing…"
Seriously? My frustration with Thomas was only increased when it was finally revealed how the trials were supposed to have found a cure. Here’s where things get slightly spoilery. Considering that the brain, or killzone, is the area that the Flare attacks, the doctors of WICKED decided that a map of the killzone would lead them to a cure. So they rounded up the brightest kids they could find, most of whom were immune to the effects of the Flare with a couple of non-immunes as variables, and put them through various trials in order to watch their brain activity. Why the trials needed to be as barbaric or dangerous as they were, was never explained. Why the trials only tested children, was never explained. Why the doctors couldn’t have gotten the same kind of data from simulated experiences, was never explained. Considering what those children were put through, many of whom didn’t make it out with their lives, for the explanation to be so lacklustre is an insult to my intelligence as a reader. I had to read that sentence out loud to my husband to ask him if I was just being picky, or if it actually didn’t make any sense. I’m not even going to touch on the characters; I found them as flat and dull as ever, with most of them being quite interchangeable. In short, The Death Cure lived up to its predecessors by being a mixed bag of unconnected plots, poor decisions and weak resolutions. 1) If life hadn't gotten in the way, I think I would have finished this in one day. And that never happens for me. You might think all action all the time would get a little old, but it seriously doesn't. I was all tense and on the edge of my seat for basically the entire book. And the zombie-like Cranks were pretty darn freaky, but not too scary for those who aren't fans of horror. 2) Now don't get me wrong, I enjoy a good romance, I really do. But sometimes, I just want to read something that isn't all about the romance. The Death Cure is absolutely perfect for that. There's tiniest, slightest, minutest about romance, but it doesn't overpower the story at all. It's more like a tiny little footnote that still manages to fit into the story perfectly. Cop out ending. That's really all I have to say. No answers, no character development. Just moving from one fight scene/run for life scene to the next with nothing to make the book worthwhile to read. It completely ruined the series for me. Dashner's series has been highly lauded by a lot of people. Many rate it just below The Hunger Games in action-packed awesome dystopia. Unfortunately, I have never liked it, as is evinced in my review for the second book. I kept hoping I would find something of serious value in it, which is why I read through to the end of the series. In fact, I liked the first book best of all of them. Even now, having finished, I feel like so much was never explained or perhaps even though out about what was going on in this world. The ending struck me as incredibly lame and ineffective. There were so many hints about deeper things going on with WICKED and with the Flare. He has all of these dreams/memories that suggest all of this crazy, interesting, horrifying stuff, but nothing else is ever done with that. Perhaps he wanted to leave it open for more books later, but I don't think this was cool at all. Anyway, I don't want to continue ranting about this, because, as I said, most people will really love this book and this series. However, if you're in the minority that was not impressed with the first book (or even two), you will not be thrilled with this one either. This series is more about action than explanation or really getting into a well-thought-out new universe. This book has more fight, action, and tears involved. It is my favorite of the Maze Runner Trilogy. It is one of the best conclusions that I have ever read. I am so going to read this trilogy again, it was so good. The ending was a great way to finish, and it was brilliantly written. The action escalates immensely with all the guns and fights between everyone. I thought that made the book more exciting. But with all the fighting, it ruins the relationships between the characters as friends go against each other. The disease sneaks into the characters minds also messing up all the friendships they built. But I think without that, it would make it more boring, so I guess I turns out good. This epic finale is a must read. I recommend it to young adults that are over twelve. It is a brilliant book that will steal your heart and twist your soul. Really sad about how everything ended. I really enjoyed the second book! There were sad, surprising, and scary parts that kept me reading and finishing the book but not enough. This was the best book i ever read and will probaly read it again because it was awesome. The book was just amazing and it all fit so well. It was a great end to the whole series. I love the ups and downs in the book. I also love the parts were Thomas has to make big decisions, like to kill Newt or go back to WICKED. For some reason though, the best part was when they all went back to the Maze. It brought back soooooo many memories when I was reading the 1st two books. This was a great trilogy! always kept me interested in what was going to happen to everyone!